Modern 3 bedroom villa close to the beach and Esmoriz station, south of the city of Porto. This is a spacious and beautifully presented property which has a top floor living room with terrace to admire the views. All rooms are bright and spacious. There are 3 floors with living room and terrace, dining room, kitchen, office, 3 bedrooms (1 en suite) 5 bathrooms, several terraces, garage, storage room, games room and a garden. Portugal's second city - Porto is a city on the rise, tempting travellers with its pretty old town, excellent wine bars and golden rooftops. It is rapidly developing into a respected tourist destination and with the increase of low cost flights it is becoming a popular alternative city break destination. 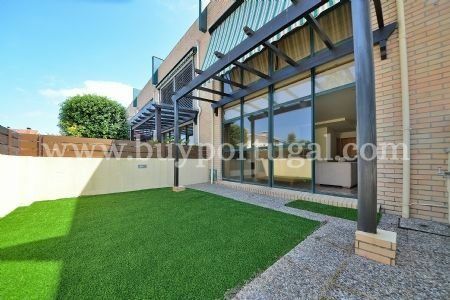 Property descriptions and related information displayed on this page, with the exclusion of Running Costs data, are marketing materials provided by Buy Portugal Ltd, and do not constitute property particulars. Please contact Buy Portugal Ltd for full details and further information. The Running Costs data displayed on this page are provided by PrimeLocation to give an indication of potential running costs based on various data sources. PrimeLocation does not warrant or accept any responsibility for the accuracy or completeness of the property descriptions, related information or Running Costs data provided here.